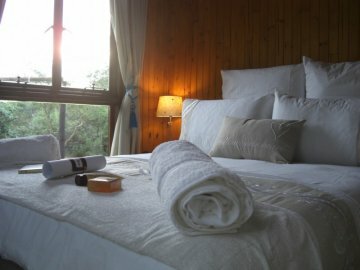 Blyde River Cabin Guesthouse is an upmarket luxury self-catering (catered on request) log cabin with an extensive private deck on the banks of the Blyde River (Limpopo Province, South Africa) situated on the fringe of a critically endangered azonal forest type known as Lowveld Riverine Forest. The guesthouse is in a wildlife area and forms part of both the Blyde-Olifants Conservancy and Kruger to Canyons Biosphere Reserve (which straddles the boundary between Mpumalanga and Limpopo Provinces) thus making the setting that much more phenomenal. Hoedspruit is the closest town approximately 20km by road. When booking you book the entire guesthouse thus enabling you to relax and enjoy total privacy and exclusivity in the beauty of the bush that abounds. 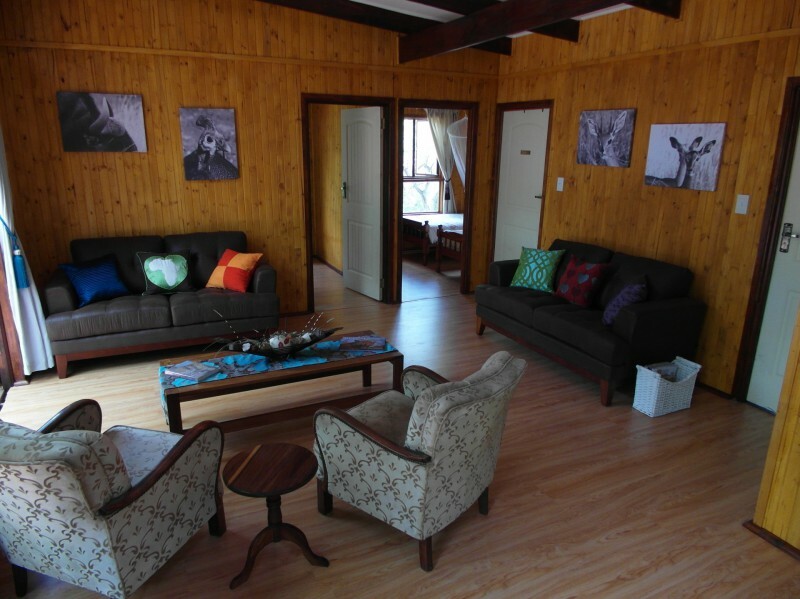 The guesthouse is fully equipped, sleeps six pax (three bedrooms: one double bed and four single beds in the two adjacent rooms) and has two self-contained ablutions, DSTV (in lounge area), air-conditioners, secure undercover parking, braai area, and a jungle gym and sand pit. Children of all ages are welcome but please remember the guesthouse is not fenced and wild animals traverse the surrounding area. 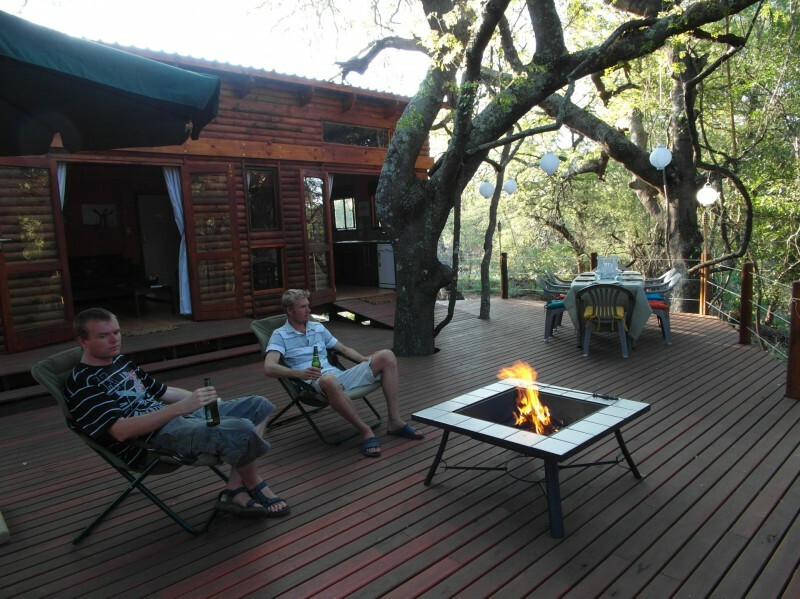 From the deck overlooking the river you can relax and admire your surroundings or scan the bush in search of the endangered and elusive Pels Fishing owl or other resident fauna surrounding the guesthouse. Hippo, crocodile, bush babies, chacma baboon, waterbuck, kudu, impala, warthog and spotted hyaena have all been seen from the deck with signs (audio and tracks) of other more elusive creatures (leopard, Pels Fishing owl and wood owl)ever present. We offer the following onsite activities at an additional cost: birding, guided bush walks, game drives, fishing, photographic safaris, hunting and children’s bush activities (Wild Child Bush School). We also do airport transfers (additional cost). 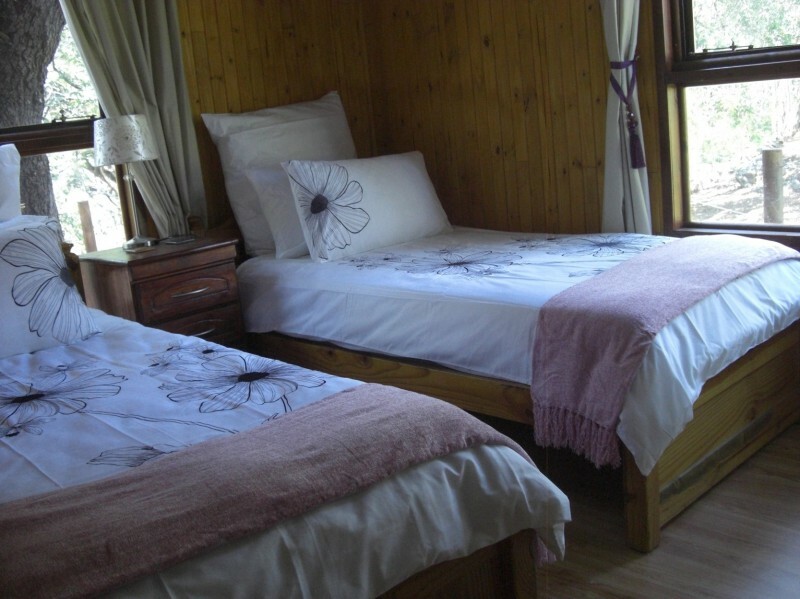 The guesthouse is well situated for easy access to a myriad of other activities available in the area (a full list is available in the guesthouse or alternatively contact us for the list) and is a mere stone's throw away from the world renowned Kruger National Park. There are over 60 different activities in the surrounding area including: day trips to Kruger National Park, abseiling, white water rafting, elephant back safaris, hot air ballooning, helicopter flips, boat trips, swimming under a waterfall, wildlife rehabilitation centres and more..